Benny and I packed up my truck and caught the Alaska Marine Highway ferry out of Juneau to Haines on about Sept 5 and had a phenomenally scenic drive thru NW British Columbia and the Yukon and on into Tok. We met up with fellow “Gang-Twangers” John Schneider of Tok and the Wingnut/Jason/John Havard crew from TX/IL. 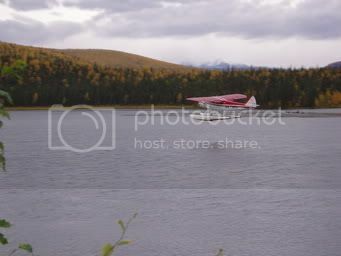 Benny and I were limited to 50# each of gear for this Super Cub fly-in Lake hunt and they weighed us to the pound so we were feverishly cutting gear down to the wire. I was dropped off first and watched a cow moose munch aquatic plants in our lake while waiting for Benny to arrive. The first day out I grunted an upper 40’s inch bull (we were in an “any-bull” area so it was legal) but it hung up at about 35 yards. He was about as nice of a bull as one could see of that size with nice palms that swept forward and distinctive, long points. Benny and I traded off turns calling with the birch bark horn my friend Dale Torma from Minnesota had made for me a few years back. 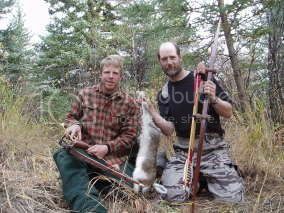 We would call each morning and then still hunt for grouse on a hill behind camp on the way back in the morning and to a calling site in the evening and loose arrows, mostly my arrows. Benny eventually brought down a plump Spruce Grouse which we cooked in an open fire stuffed with lingonberries (low-bush cranberries). I was on a mission to arrow a teal and had a couple close calls but no-go. 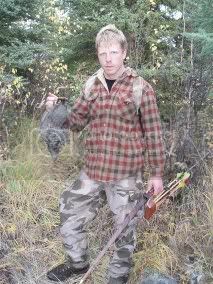 We also started finding snowshoe hares on our still hunts and we tag-teamed one for the pot. We saw a few moose that would come to our lake and feed on the aquatic vegetation as it was a very shallow lake but only the one bull (three times) ever came in to our calls. On the second to last day the same bull came into Benny’s call and was about twelve feet away from me on the backside of a cluster of black spruce trees and in between the two of us. We both came so close to getting a shot, or trampled, but that bull had a charmed life around us! This hunt ended with not much hurrah. As we awaited our plane we picked five, quart bags of lingonberries and I have them soaking in rum now which makes a tasty liquor. We had an early morning drive back to Haines to catch the ferry and saw a hundred or so Dall sheep ewes and a mountain grizzly on the side of the road in the Yukon. Two days later we mailed Benny back to dental school in Portland and I was back to work but instead of dreaming of the once-in-ten-lifetimes brown bear tag that I had drawn and my upcoming trip to Unimak Island, I was confronted with the harsh reality that my lady friend Donnie had just been diagnosed with the blood cancer, Multiple Myeloma.